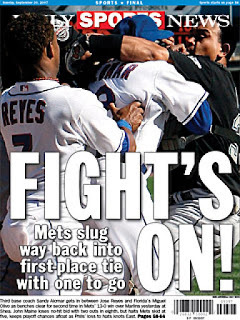 Saturday September 29th 2007: The reigning NL Eastern Champion Mets were in the midst of one of the worse collapses in history. 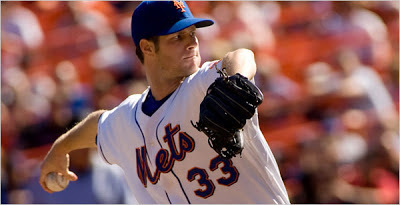 On September 12th New York had a commanding seven game lead over the Philadelphia Phillies. But these Mets fell apart, losing 11 o15 games, plus a streak of five losses in a row. As the Phillies stayed hot, the Mets fell a game behind in the standings. On this Saturday Willie Randolph's Mets (88-73) hosted Fredi Gonzales fifth place Marlins (70-91). John Maine took the mound against Chris Seddon. Today Maine would step up as he did in last years post season & have one of his best games ever. 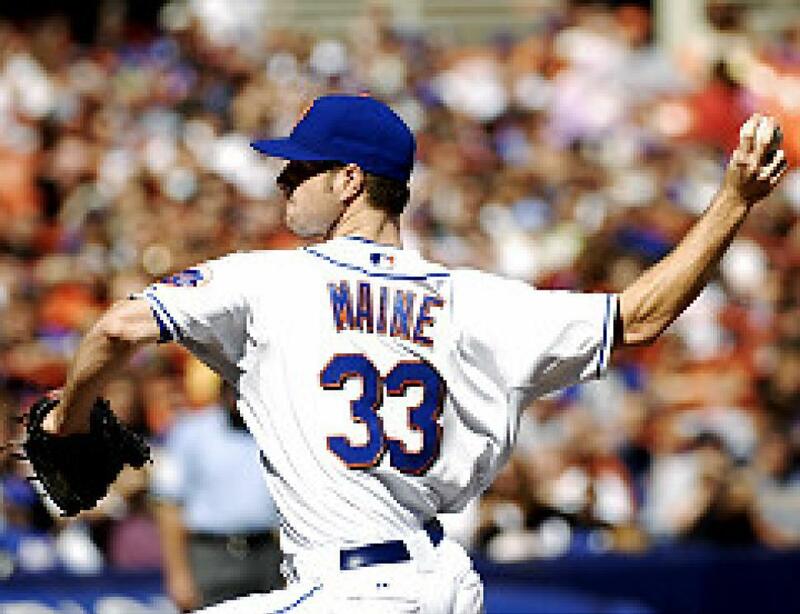 As the Mets were facing elimination & down in the dumps Johhny Maine showed heart. Although he walked Dan Uggla in the 1st inning, he quietly kept retiring the side & posting strike outs. In the 2nd inning he recorded two strike outs, in the 3rd he struck out the side. He would add a pair of strike outs in each of the next three innings as well. By the middle innings it was noticed Maine had a no hitter going. The Mets had an offensive explosion this day, taking an early lead on RBI singles from Moises Alou & Carlos Delgado in the 1st inning. In the 2nd, Lasting Milledge singled & was sacrificed to second by Maine. Luis Castillo scored him on a base hit. David Wright walked, Carlos Beltran & Moises Alou added RBI singles to make it 5-0 Mets. Lastings Milledge then hit HRs in his next two at bats, as usual he show boated & admired his blasts rounding the bases. This along with the no hit bid & the 9-0 lead didn't sit well with the Marlins. Florida pitcher, Harvey Garcia threw a pitch behind Castillo's legs. 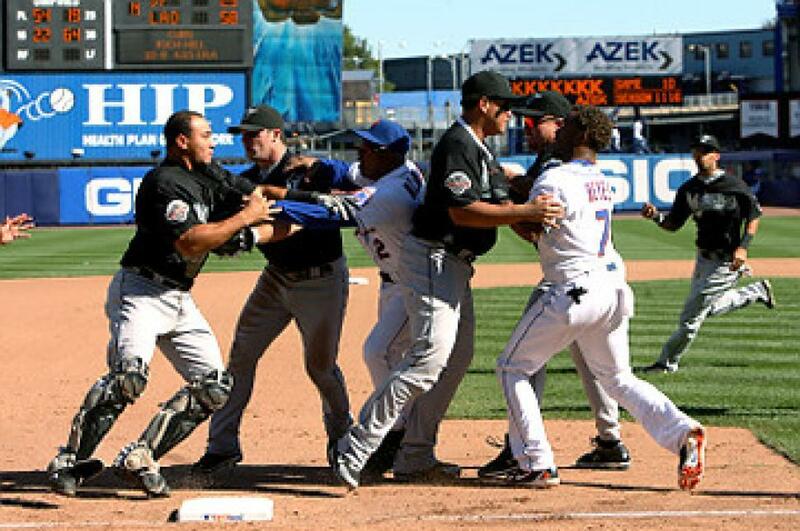 Both benches cleared & the bullpens emptied. 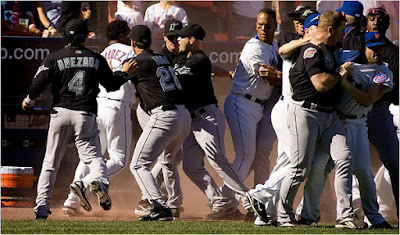 Mets pitching coach Tom Peterson was having words with Marlin catcher Miquel Olivo but was pulled away by David Wright. Jose Reyes was on third base & antagonized the Marlin catcher, bantering him. After Castillo walked, Olivo charged down the line at Reyes, the two were friends & Reyes thought he was originally kidding. A fight broke out, Mets third base coach Sandy Alomar served as a buffer as did Miquel Cabrera. 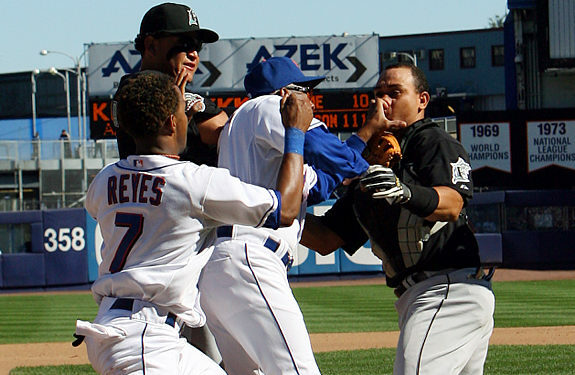 Quotes: Jose Reyes: He's kind of crazy sometimes, I said, 'Let's go. Let's fight.' I can't say no. I'm not scared. We're both men." Said Olivo: "He told me, 'Let's you and me fight. Let's go.' I don't know why. I'm on the mound waiting for the pitcher and he's talking (smack) over there....We are good friends. Today, I don't know what happened with him. We played winter ball in the Dominican all the time. I don't know. Today he might have gotten too excited." The Shea Faithful who had been all over Reyes for his lax play & .215 batting average in September cheered him today with the 'Jose Jo-se Jo-se" chants. As the game resumed, Wright added an RBI hit, Ramon Castro hit a HR & David Newhan drove in another as the Mets went on to an 13-0 win. Maine held the Marlins hitless until the 8th inning. With two outs, Paul Hoover who had come in to replace Olivo when he was ejected for the fight singled softly on weak grounder to third base. The no hitter was gone, the Met fans gave Maine a standing ovation as Willie Randolph took him out of the game & brought in Willie Collazo to get the third out of the 8th inning. Maine went 8.1 innings with no runs, one hit, a career high 14 strike outs & two walks earning his 15th win of the year (15-10). 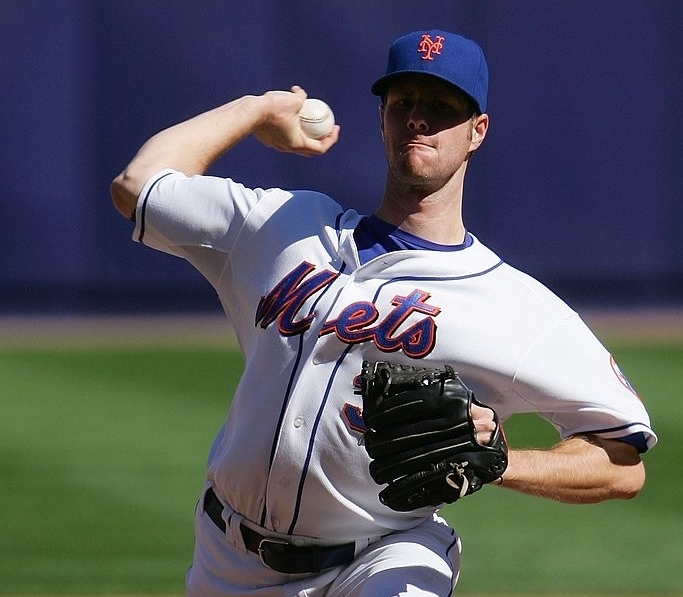 This was the 32nd one hitter thrown in Mets history. The Mets were tied for first place but lost the next day eliminating them from the post season.